As we continue to follow Moores law regarding processing power doubling every other year it is becoming increasingly more common that the sole piece of hardware standing between you and n00b status is your graphics card. As CPU’s become faster they are also becoming far less utilized and your graphics hardware increasingly more so. The increase demand in faster graphics cards has fueled the industry in its drive to release faster, better stronger graphics cards every few months. The current contender for the mainstream gaming community is the Nvidia GTX 560 which comes in at the pricing sweet spot of around 250 dollars and provides good performance. 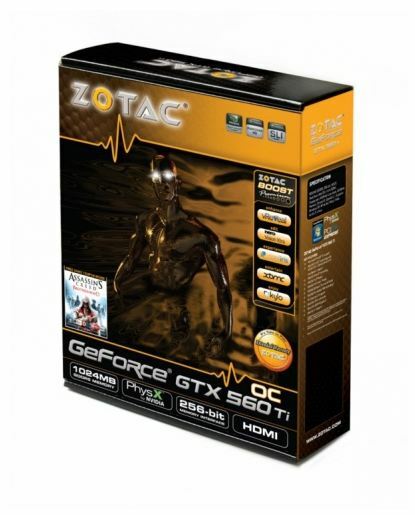 Our friends at Zotac have shipped us their rendition of the GTX 560 aptly named GeForce GTX 560Ti OC which is short for an overclocked GTX 560. Join us while we review this marvel of computer gaming hardware. Decked out in orange and black the GTX 560 stands out. Experience Microsoft® DirectX® 11 technology the right way with the high-performance ZOTAC GeForce® GTX 560 Ti OC graphics card with hardware tessellation technology. The ZOTAC GeForce® GTX 560 Ti OC renders the latest games with stunning clarity and detail for an unmatched visual adventure. NVIDIA® SLI™ and 3D Vision™ Surround readiness enables two ZOTAC GeForce® GTX 560 Ti OC’s to work together and deliver up to twice the performance of a single card or enable triple-monitor gaming with stereoscopic 3D effects for the ultimate gaming experience. NVIDIA® PhysX® technology takes realism to another level for unprecedented immersion with the ZOTAC GeForce® GTX 560 Ti OC graphics card. Reviewing the graphics card is much like any other review we do. We show you all the goodies, up close pictures of the unit then benchmark it with both synthetic benchmarks as well as real world game benchmarks. DO NOT get one of these unless your PC has more cooling than a freezer! It’s the hottest running card I’ve ever used and on any AAA game title it hits 100c (I really wonder if it could boil water? ), the fan only goes up to 75% speed (hard lock) and it crashes most games due to heat issues after a while of playing, and that is with it’s own fan & four (4) cases fans blowing around it. I’d hate to see the heat from it if you over clocked it!!! Good card, great price. Nice combo!